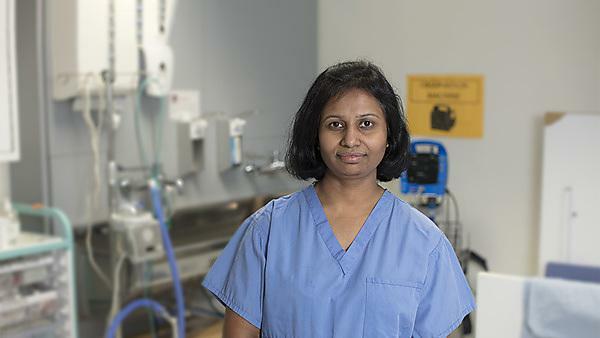 Anitha Rego found the spark to move into mentorship and teaching through her collected experiences, initially studying BSc (Hons) Health Studies, and later graduating in PgCert Clinical Education at Plymouth in 2017. Anitha's current role is as a Practice Development Practitioner for the Torbay and South Devon Healthcare Trust, based in Torquay. I did not originally plan to be a nurse – my circumstances led me to be one – but it has most definitely been the best thing in my career. My training and first job was in a charitable institution in India, where people aren’t exactly rich and resources were limited. It was a privilege to serve those who were grateful for any care you could provide. This motivated me to aspire for higher standards in my life as a whole. As I came from another country, I didn’t even know where to start. My main purpose back then was my job. However, higher studies have always been something I had aspired to accomplish. The first opportunity came as a single standing degree module with Plymouth that was made available through my workplace, which inspired me to progress to study BSc (Hons) Health Studies. As I was coming from a different culture, the thought of completing my initial degree while in full-time work, was quite daunting. I had to get used to a completely different way of studying with assignments and no exams. I had good support from my tutors and the library though, and great service from the learning and development team and my mentor during my studies. It was during this period of study at Plymouth that I enrolled and completed my mentorship module. This was where I discovered my passion for teaching – the positive experiences and comments from students were so rewarding. In 2014, I had the opportunity to be accepted in an educational role in the workplace. As the postgraduate certificate was deemed pertinent to my role, I was sponsored by the Torbay and South Devon Healthcare Trust to complete this. My previous experience with the University had been good, so it made sense to carry on and study there. Looking back, my education and networking at Plymouth has stood me in good stead to ensure I understand that any problems encountered in my workplace are not unique and that I have the tools to come up with possible solutions to solve them. The teaching sessions we had to prepare to present to other participants ourselves were enjoyable and gave us the opportunity to look at various methods of teaching. One that was especially memorable was the outdoor kitesurfing lesson that one of the student colleagues presented – I would have never been brave enough to do anything like that! Writing at postgraduate level was a challenge though and the learning and development service read my assignment and gave me plenty of pointers to think about and make it a good assignment. My mentor was instrumental as well, suggesting alternative ways of thinking about the topic. I am grateful to my tutors, as nothing was ever too much trouble and there was no question too big or small to ask. They were always willing to provide one-to-one support with a smile on their faces. The support from them, especially during the postgraduate programme, was really great – they wanted our feedback too, taking on-board our suggestions and were willing to make changes. The outside speaker's varied sessions were inspirational as well, and provided some very good ideas for teaching methods. If I was to start university again, I would organise my time better, recommend myself to begin postgraduate studies at an earlier stage, and publish some of my hard work – imagine what a rich database of information that would be, if most of us took the opportunity to publish our work! When I came to the UK my first priority was my job, but as new doors opened up to me I have benefited from a personal development which has seen my career progress towards opportunities as a manager and clinical educator. My next aim is to apply for a position as a lecturer in the health and social care field. I have mentored learners all through my career. The mentorship module during my undergraduate degree provided a good insight into mentoring. It was the PgCert Clinical Education at Plymouth which helped me to understand the wider perspective of teaching in higher education. I have always loved to teach and I wish I had been able to undertake this earlier in my career. As a Practice Development Practitioner for the Trust, I typically teach small groups in the form of practical workshops, or discussions outside the clinical setting, in order to provide an atmosphere conducive to learning. I support the staff in the clinical setting, so that I can impart knowledge or perform a clinical procedure with them, before gradually withdrawing when they develop competence. I run in-house courses on related topics and these have been attended by multidisciplinary faculties. I also create educational material as posters, laminates and videos, which learners have access to anytime and can learn at their own pace. I assess learners on the City & Guilds diploma in the department, as well. The biggest lesson in teaching I have learnt is that no one way works for all! I have found it helpful to discuss a range of strategies and options with the learners that would benefit them. Diversity brings an interesting mix in the clinical setting with differences in culture, language and the ever existing hierarchy in the clinical setting. The small group teaching sessions, especially the practical workshops outside the clinical setting, have the most impact as the learners can make mistakes and learn to appreciate the difficulties in the clinical setting. This also helps to build their confidence and overcome barriers in the clinical setting. The postgraduate programme at Plymouth opened my mind to the wider perspective of teaching in higher education. It has helped me develop my confidence and provided me with strategies for small group teachings, which I used to dread and struggled with before. All through the programme we were exposed to some interesting and varied techniques used by the tutors and other presenters. The feedback from the observed teaching sessions that were part of the programme and the case studies presented for the Associate Fellowship and the Fellowship of the Higher Education Academy were useful too, as it allowed me to reflect on my teaching strategies and helped me to identify my strengths and work towards my weaknesses. Since completing my postgraduate certificate in clinical education, I have joined the trauma clinical division of AOUK – a non-profit organisation dedicated to the advancement of the care of those suffering from musculoskeletal injury and disease – and teach on their annual basic principles for theatre practitioners course. I have presented at my first conference and with support from my tutor I was accepted for poster presentation at the Academy of Medical Educators (AoME) conference on ‘Fairness and Equity in Medical Education’, which took place in Sheffield in April 2018. I have also joined South Devon College as a bank part-time lecturer. Although I have yet to do any formal work with the college, the interview process was interesting. We had to do a formal lecture for the foundation degree students and were then evaluated by them. I have been fortunate enough as well to have been enrolled on to a masters programme. The module I am currently taking is on simulation and I look forward to hopefully get actively involved in simulation, both in the department and within the Torbay and South Devon Healthcare Trust. When I’m not busy with work, I love going to school outings with my five year old, as they are so full of energy and fun – I wish we could keep that zest all through our lives! My family, especially my two children, definitely keep me going and aiming higher. Explore education theory and how it can apply to teaching in the clinical environment. This one year postgraduate certificate programme is designed to meet your needs if you are a doctor, dentist or healthcare professional. Develop knowledge and skills in teaching, learning and assessment, and be primed to confidently transfer your experience into your professional role. On successful completion of this award you may choose to progress onto a second year of study towards a postgraduate diploma, after which there is the possibility of a third year of study working towards a full masters degree.